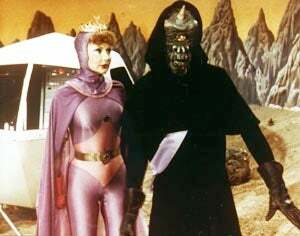 If you've never seen Jason of Star Command, you're in for a crazy mind-warping treat. This space adventure show from the 1970s feels like an old-school adventure serial, with Harryhausen-esque special effects. And it co-stars James "Scotty" Doohan in the first season! And it's all on Hulu. This TV series was actually a spin-off of another Filmation show that featured Lost in Space's Jonathan Harris called "Space Academy" and his character would have in fact appeared in this new series if not for the unfortunate falling out between the actor and Filmation studios. Though they were able to get none other than James Doohan (Star Trek) to play a new character called Commander Carnarvin that filled what would have been Harris' role in the series though he left in the second season as to join the original cast for Star Trek: The Motion Picture. The series originally aired as something of a throwback to the movie serials of the 1930s and was a 15 minute segment of the Tarzan and the Super 7 TV show. With the second season the running time for each episode was increased to a half-hour and wasn't attached to another program.